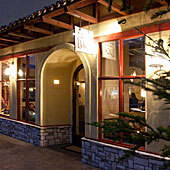 A great Italian country style restaurant with a modern flair in the heart of Carmel. A wood fired pizza oven is the signature cooking style that not only produces great pizzas but other dishes are cooked there as well. Already a local favorite, this restaurant provides superb food in a great environment. Cantinetta Luca is exactly the kind of Italian bistro that one is always looking for. The food is perfectly prepared, simple in concept, sophisticated in execution and really delicious. A wonderful addition to Carmel. The night we visited, it was so popular they had to turn guests away and it was mid-week. The interior decor of Cantinetta Luca is antique/modern, inspired by the old refurbished buildings of Italy. The design is a blend of stone, brick and glass, chiseled wood and bright Italian colors. The decor features a barrel vaulted ceiling, brick and chiseled beams contrasted by superb contemporary (but not ultra modern chrome and leather) furnishings and modern lighting all set off by rich earth colors and textures. The restaurant area is divided into several different sections that provide a more intimate atmosphere. There’s always lots of activity at Luca giving diners the opportunity to watch chefs in action because the restaurant and bar were designed around an open kitchen with the stove centered as an island, accessible to chefs from all four sides. Cantinetta Luca also has a glassed-in meat aging room where its housemade "salumis" are dried and cured. 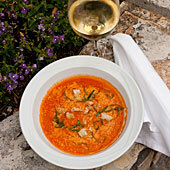 Cantinetta Luca specializes in antipasti, a dozen or so varieties of "salumis" and handmade pasta. Whole fish and roasted meats are served family style. All of the presentations are simple and rustic; food prepared with fresh seasonal ingredients to bring out bold flavors while at the same time exercising a finesse that keeps the flavors in balance. Cantinetta Luca is the kind of neighborhood restaurant that you dream of having in your neighborhood so you can count on a delicious meal in an Italian atmosphere that is both fun and atmospheric with good service that is both friendly and fast. Judging by the number of dinners arriving and immediately greeting friends already ensconced in their favorite tables, this is already a favorite with the locals. 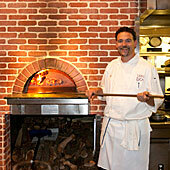 So when you are in Carmel, you can't go wrong with Cantinetta Luca if you like good Italian country inspired food. It opened in 2006, so it has had plenty of time to get everything right.